The Cairn Terrier is one of the oldest of the terrier breeds, originating in the Scottish Highlands and recognized as one of Scotland’s earliest working dogs. 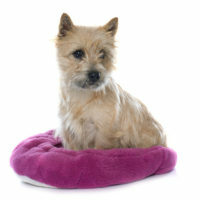 A small, rugged dog with a shaggy coat, the Cairn Terrier is outgoing and a lively addition to any household. This dog enjoys meeting new people and especially enjoys being around his human family. The Cairn will stay close to its people and wants to interact with them as much as possible. Cairns get along well with children, and will happily play with them. These dogs are generally healthy and live on average about 12 to 17 years. If you want a little Toto of your very own, Cairns are bred at TLC Kennel with you in mind.